Donald Trump isn’t an extraordinarily brilliant man (as those who have lent him money in the past can attest). He is a man who has conducted business through aggressive bullying and con man tactics which include threats, insincere pandering and lies that comfort or affirm those who want to believe them. Had Trump been smarter, we could have been in far bigger trouble. If once he was inaugurated, he offered an olive branch to Democrats and tried to govern as an outsider that could work with both parties, he could have garnered far greater popularity and the power that comes with it for a president. It would have been as scary as it would have been brilliant since his penchant for dictatorship would have exploited that in ways that could have truly threatened the future of America. So folks should be breathing a sigh of relief that Trump is a small minded-slave to his core insecurities and fragile ego. The damage he is doing is significant but reversible over time. As bad as things are under Trump, it could have been far worse. Being so reptilian-brained, Trump has operated by using his crude emotional instincts for much of his life. It has mostly led him to failure and bankruptcy again and again despite his propaganda about his constant success and vast wealth. Before The Apprentice, Trump was in desperate times. Few banks would lend to him anymore after his defaulting on his loans repeatedly. Then The Apprentice became a hit and rescued him, churning out wealth to him and growing the value of his name and its licensing which is where his greater wealth really came from (his father left him a fortune so he was always wealthy thanks to Daddy). That show, like many reality shows, was based on a lie, that Trump was a remarkably successful businessman who had an eagle eye for good decisions. Aside from his book, “The Art of the Deal”, which he didn’t really write, this was actually his first real success with the public and it was based on his lying about himself and developing a fan base/personality cult. It was the template for his candidacy for President. Being a narcissist, the adulation of his fans was addictive but it was also the only reason for his one big success in life. Realizing this, Trump modeled his campaign and his presidency after what he had learned from The Apprentice, as long as you deceive and pander to build and strengthen a devoted base of fans, you can succeed. Trump’s defiant stance of only being a leader for his fervent followers is apparent in most everything he does. The attacks and insults he tweets out to all who aren’t obsequious to him, Republican and Democrat, the attacks on all sources of facts, from the intelligence community to the press to the courts are all aimed to reinforce to his base that he is the only one they can trust. The world is in a conspiracy against “us” and only Trump can save “us” from “them”. There are ulterior motives here but all still serve Trump’s priority of building a wall of ignorance around his base to preserve and enhance their blind loyalty to him. Trump knows the investigation into his campaign’s collaboration with Russia and his subsequent obstruction of justice is ramping up and he knows the truth of what actually happened (which is why he isn’t welcoming the investigation to clear him). It is also why he is weaving such blatant lies and propaganda around our government and democracy, to discredit everyone but him in preparation for the eventual time when indictments come down and the full truth of his betrayals become public. He is grooming his base to essentially be a cult-like army that will rebel in his name against our own government, courts, democracy and truth. The problem though with putting all your eggs in one basket that has no integrity, is that it can collapse. After only seven months in office, that’s already what’s happening to Trump. His “basket of deplorables” is becoming frayed and they are indeed dropping out. A poll from Quinnipiac University found that only 33% of Americans now approve of Trump’s performance in office, a new low that the poll found was reached primarily due to a growing erosion of his base, white non-college voters. In this poll, this majority of Trump’s base, which of course voted him into office, now disapproves of him. That’s quite stunning to consider. He hasn’t even been in the White House for a year and already, he’s lost the majority of voters that elected him. Support among Republicans still remains high but has been receding, this poll found 76% of Republicans still supporting Trump but that number was above 90% just months ago. And as of this year, only 25% of Americans identify themselves as Republicans so Trump only has a majority supporting him in a very narrow segment of voters. Trump’s response to the deterioration of his support is what one should expect from someone who on one hand, lives in a bubble of delusion and doesn’t believe what he doesn’t want to believe and on the other hand, has only one game plan for success. He is doubling down on his belief that if he rallies his base, at the expense of further polarizing the majority of Americans against him, he can once again “win”. It would not be surprising if Trump believes his own propaganda, that the 33% (and shrinking) of Americans who support him are really a vast “silent” majority of Americans. He may continue to believe that no matter what he does, those mindless supporters of his that he actually sees as easy-to-fool inferiors will eternally bow to him whenever he snaps his fingers. He may actually think he’s loved by the majority of Americans and those residing in his bubble with him know that they would be kicked out of the bubble if they ever disputed that. As Trump continues on, his agenda is focused on propagandizing his shrinking base to keep them disbelieving the torrent of damaging truths pouring out about him from every direction. As he is revving up the manipulation of his base’s hate and fear, whipping them up as fellow “victims” of the enemies surrounding “them”, the scales of reality continue tipping against him. 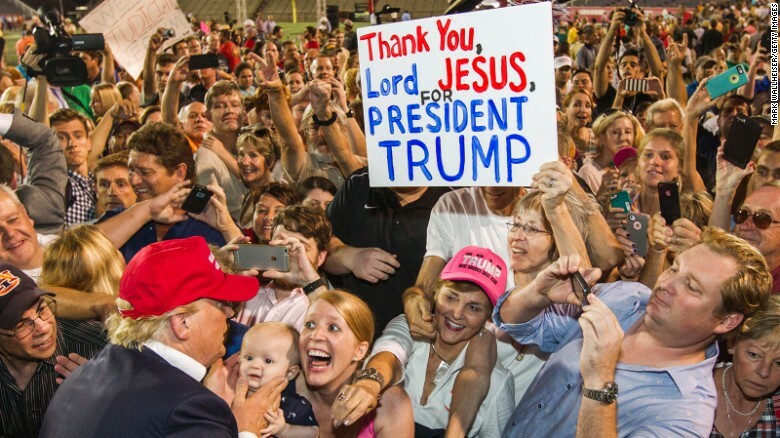 Trump’s success has been based on the cult of personality and while he’s been right that cultists can’t be convinced by reason out of believing in their cult leader (even if he shot someone in the middle of 5th Avenue), they can grow discouraged when The Promised Land that cult leader promised that only he could deliver (and only for them, “the believers”), doesn’t come. The Mueller investigation continues despite all of Trump’s propaganda against it. Other Republicans including Mike Pence, are responding to Trump’s obvious decline in support by preparing to run against him or instead of him for president in 2020. Trump’s ongoing failures, the failure of Trumpcare and the failure of many other of his stated agendas (the wall Mexico will pay for, infrastructure repair, starting a trade war with China, ending violence in America, stopping Muslim immigration, etc.) will exact a profound cost on the enthusiasm of Trump’s base…which is all he has now. A reckoning for Trump is coming on so many fronts and Trump’s “plan” to triumph over all of it by deceiving his base even more and transforming them into Soldiers For Trump has a fatal flaw that he can’t accept…they are leaving him bit by bit and he is chipping away at their enthusiasm for him. There are still and always will be the Trump cultists who will excitedly support him no matter how far he falls or how horrible he is exposed to be by “the fake news” but while they are the targets of the majority of Trump’s efforts lately, his growing propaganda and lies, they are a small minority of Americans that is only growing smaller each day. And even Trump knows what happens to reality shows when their ratings sink low enough. Is There a Political Methadone to Wean Repubs Off of Their Trump Addiction? What Would Trumptopia Look Like? Congressional Democrats on Friday demanded to see all of U.S. Special Counsel Robert Mueller's evidence from his inquiry into Russian interference in the 2016 election, as they consider how to use the probe's findings against President Donald Trump. An off-duty journalist was killed after shots were fired during rioting in the Northern Irish city of Londonderry overnight, an attack that shocked the province and police said was likely the work of nationalist militants. U.S. homebuilding dropped to a near two-year low in March, pulled down by persistent weakness in the single-family housing segment, suggesting the housing market continued to struggle despite declining mortgage rates. A year after moving to Londonderry, celebrated young Northern Ireland journalist Lyra McKee wrote about how she looked forward to "better times ahead and saying goodbye to bombs and bullets once and for all". After months as volunteer activists demanding that President Donald Trump be impeached, Eileen and Michael O'Brien sat on their couch on Thursday, cracked open a laptop and began to read the 448-page special counsel report that liberals have dreamed would make impeachment a reality.